I just want to hug (your FACE)! Now that my obsession with Monster Hunter: World is easing, my attention has been oozing around aimlessly wondering what next short-term project I'm going to flake out on. The other night I leaned back into my chair, in my home office (which, in case you didn't know---and you shouldn't know because I'm pretty sure I haven't mentioned it here yet---is my old high school bedroom! No, I do not live with mom. I bought the house from her when she moved to VA.), and began admiring my idiot teen self's taste in decor. The room is still set up (for the most part) as it was when I was a kid, complete with abandoned signage, a string of Christmas lights, and a few random selections from old Rolling Stone magazines and a few Wizard issues. Above my desk and near the window is a full-page advert for the Ripclaw Special (1995) cover, an old Image Comics character that I used to draw as a kid. Er, that I used to try to draw as a kid. I haven't really drawn much of anything serious in a few years. I've recently tried to sketch a few ideas for a water color, but so far nothing has excited me. Seeing the face on my wall got me thinking: if I'm struggling to create something, maybe drawing someone else's work could put things into motion? Off to Google I skipped. I was surprised to see a few references to this specific cover. There were a few eBay listings, and a few comic fan sites floating the image, but it wasn't until I scrolled a good ways down that my heart nearly stopped. What's this?! A blog site by Kevin Nowlan, the guy who actually inked this cover? The thumbnail showing in my search results appeared to be a black and white inking of it! "Wow! If it's a high enough resolution, then maybe I will try to color it!" I thought. I mean, how cool would it be to color my own Ripclaw? After clicking the link I learned that I was very much mistaken thinking that this might be a high quality inking. No. Instead, it was a high resolution pencil drawing by the artist Jordan Raskin! Holy monkey balls, Batman! A scan of the original pencil work for the very cover I have pinned to my wall! Screw colors! Ima ink this muther! So, I downloaded the image (Image! ), wiped the drool off my screen, and started in. I'm inking with a stylus laptop so I'll post the source material, followed by a few screen shots of my progress, as I progress (be sure to change the pronunciation through your internal voice, reading that please and thank you). I'm very excited by this discovery and, to be honest, have no one that would even bother looking at this lol. Maybe there's one or two comic kats here in the MOFO kingdom that might appreciate it instead. My goal is to get some honest practice in drawing digitally, and to use this as a bridge to hopefully create something new, down the road. Fingers crossed that I don't quit after the weekend. For anyone interested, the blog site is here, and has several years of posts and sample pencil and ink work. Great stuff, if you're into it. Here is the cover for reference. "My Dionne Warwick understanding of your dream indicates that you are ambivalent on how you want life to eventually screw you." "Ever try to forcibly pin down a house cat? It's not easy." I remember Rip Claw. I think he was a member of "Cyberforce" at some point. Some felt he was a rip-off of Wolverine (although I believe he was supposed to be Native American) - then again, almost everything from Image was derivative (and then again again, almost everything in comics has been derivative). Years back I did a group shot of some characters I created, I got it scanned somehow (- the original was fairly large, so I probably scanned it at a job I had on an oversize scanner) and decided to try to color it on the computer - I think using Photoshop. I quickly realized that there could be no broken black lines (or else he color would "seep" out) - so I had to close all my inking with the program - then started filling in areas with color - I never finished it and don't know what happened to the computerized version (all I know is it's gone). I'd also made some copies of the original illustration and decided to hand color one of the copies using Dr. P.H. Martin's colored inks. I flubbed the mixing of flesh tone on one character, giving her extremely red legs which kind of discouraged me, so I never finished coloring it - I think I have that partially colored copy in a folder somewhere. Man. I HATE losing things saved to old PCs. =\ Back in college days I was obsessed with 3d modeling and animation so I found a bootleg copy of 3dmax to teach myself. 56k modem dial-up, btw. Maybe of 2 years of tinkering around, I had a handful of clips that I thought were cool (they sucked, but I made them, so). My first job, my boss gave me a copy of WIN2000 as an OS upgrade for my home PC so that I could work from home as needed. I still remember the option window "Would you like to keep files on your hard drive or completely erase everything as if it meant nothing?" I'm paraphrasing of course. Needless to say, I click save it all and it thought differently of my choice. As to Ripclaw, yeah. 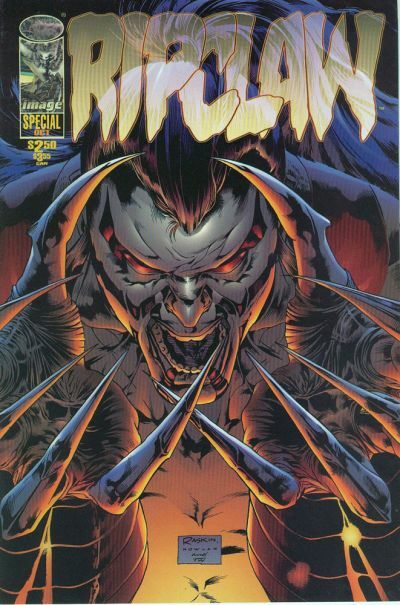 Total Wolverine ripOFF ;P I was new to comics, everyone was raving over Spawn, The MAXX was on MTV's Oddities, so I was hooked. I never read Ripclaw, but I totally loved the artwork and framing. And yes. I'm attempting to do this digitally. I used to have a tech pen set ...like 20 years ago, but I think technology has come a LONG way since. So I'm trying. Totally know that "seeping" frustration lol. I'd love to see anything you got. Anything anyone has actually. From the blog post linked in the OP I downloaded this digital scan of the pencil drawing. If it's not clear already, I do not at all claim to own this image. This was drawn by artist Jordan Raskin for Image Comics way back in the early 90s. I only want to attempt to ink this really cool pencil drawing lol. After downloading and loading up into Photoshop, I spent a good bit of time screwing around with brushes and settings to figure out how best to start this thing. I ended up knocking down the source opacity to like 24% so to help visually separate the background source from my own marks. If anyone cares, I'm using Kyle's Manga - Edge brush which is part of a brush set downloadable from Adobe.com. Tip is set to 10px and is pressure sensitive so the stroke thickens the harder I press. Once comfortable with everything, I started on the first claaaaaaaaaw. Dramatic emphasis is mine. Wait. I'm typing this. Nevermind. I have maybe 1.5 hours into it at this point. Last edited by Chypmunk; 3 days ago at 03:48 AM. Yeah. Technically tracing the rough pencil lines to clean up, fill in gaps, and to give something proper to who ever is tasked to color the sheet. Kewl, hope you stick with it and get to present the finished article. Paper is delicious. I had a few friends that were partial to Elmer's Glue, but that made better gooey gray balls (the glue, not me) than delicacies. In my humble opinion, of course. I put about an hour in last night and also the night before. Should be able to get some time in tonight if weather and power hold. Rumor has it we're under a tornado watch. I don't see it. Don't worry, we get those a lot. People are a good bit overly-cautious here with regards to the weather. You might notice my battery was low when I made the screencap. Had I been paying attention I would have posted last night before the battery blinked out mid post. Anyhoo, for now here's the latest update. Just curious - is a lot of comic book inking done on computer these days? Or do most inkers still work with brush & pens? I've got a distant cousin who is a professional inker mostly for DC comics (his name is Mick Grey). I believe he still inks by hand. I've never been able to figure out how we're related, I just know our mom's are some sort of cousins (but not first ones). In 1998 he took me with him to a comic-con for a couple days - I got to sit with him on the artist's side of the table - little kids were bringing their sketch books up and I was drawing my own superheroes in them and signing them - then they'd show their dads and they'd say "Who the heck is that?" We hung out with Bob May (among other people) at that convention - he was the guy inside the Robot on Lost In Space - he told us some great stories! Anyway, I once worked for Murphy Anderson (a Golden & Silver Age comic artist & inker) when he ran a comic book 4-color process company - it was an arduous process of cutting "amberlith" overlays on top of inked "flats" (four comic book pages) to make film negatives that would ultimately result in printed comics in color. From what I know that process is now antiquated and coloring is all done with computers. An interesting tidbit about Mr. Anderson - he always came to work in a three piece suit, complete with a watch chain! Meanwhile all the "kids" working there wore t-shirts and shorts! Murphy's son (Murph Jr.) ran the day to day operations while his dad was usually in his office taking care of business. At one point Murph Jr. lived not too far from me and I'd go swimming over at this house! As you can probably tell, I once had ambitions of becoming a comic artist. AWESOME STORY!!!! Man, I loved reading that. I have no idea how things are done today. I've seen a few videos of McFarlane using a Cintiq (I think?) but I don't follow any of it anymore. I would assume so though. Tech has come a long way and I feel like things can move much faster in layers. Especially with several undos at the press of a button. But I really do not know. Back around my senior year in high school I thought I might try, but my drawings were weak. I would write stories, but never had the skill to put that into some kind of story board. I didn't know anatomy much, but I tried. Small town here. No one knew anything, but a few people would act the part. I had a hard time finding anyone to learn from. Mostly I just grabbed books from the library or bookstore to try to learn something from. I'd tried to draw poses from mostly Image comics but was young, clueless, and didn't know how to do anything. I called a local print shop once to get an estimate for a print. When they gave me a quote for a minimum order I about stroked out. That was pretty much the end of my run lol. I did end up going on to college and got into graphic design there, so it's cool to see the term "amberlith" being used again :P We had to learn how to use velum and layers as you're describing, but digital was already fairly well established at that time. I mean layout in general, like Quark Xpress. I think we were using Photoshop 4 at that time. I met a kid my Junior year who wanted to produce a comic line. He had a guy that could draw and needed someone to ink and color. I offered and was kind of excited for it. I inked the test sheet he gave me (tech pens and Bristol board), scanned, and colored it in Photoshop. There were a few single posed characters too. It was goofy stuff, but the guy was really excited. I couldn't keep up though given class load, working, and other part time jobs. I took a few more classes in design and illustration but got frustrated. Switched over to fine art, painting, and enjoyed that much more.